Beards have been around for as long as men, and over the years there have been countless styles created. 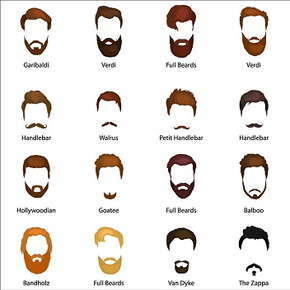 Many of these are still in vogue today, which means that men wanting to grow a beard have lots of options to choose from. Here’s a quick run-down of the most popular beard styles. Full Beard. The full beard is a classic style with a distinct shape that includes a beard and mustache. The beard starts at the cheek line and all the hair below that it allowed to grow naturally. Men with high cheek bones may need to sculpt the top line of the beard a bit lower, from the side burn to the outer edge of the mustache. This style is similar to other full beard types like the French Fork, Ducktail and Garibaldi. Bandholz Beard. The Bandholz is a mustache connected to a full beard. The beard and mustache can both grow freely, with the beard extending below the length of a Garibaldi. This style is named after Eric Bandholz, the founder of a men’s grooming products company. French Fork Beard. A type of full beard, the French Fork beard extends below the chin, with the hair split into two “forks.” It picks up its name from the first French forks, which had two prongs. It shares the full beard look with the Ducktail and Verdi. Garibaldi Beard. A full beard with an unkempt look, the Garibaldi has a rounded bottom and a mustache attached to the beard. It is named after Giuseppe Garibaldi, a 19th century Italian general. Although the beard can be allowed to grow wild, the mustache should be kept neat. The bottom of the beard should be wide, but shorter than other natural beards like the Bandholz. Ducktail Beard. Another full beard style, the ducktail beard gets its name because the hair below the chin resembles a duck’s tail. The hair on the upper part is trimmed shorter, while the hair on the chin can be grown out as long as you want. This provides a mix of well-groomed sophistication and rugged manliness. The ducktail beard is similar to other full beards like the Garibaldi and French Fork. Circle Beard. The circle beard is named for its shape — a circle of hair formed by the mustache and rounded goatee, with the sideburns shaved. It is similar to the Balbo and extended goatee. Goatee & Extended Goatee. The goatee is a beard that covers only the chin, like the hair on a billy goat’s chin. The goatee starts just below the lower lip and is the same width as the mouth, with the hair rounded off at the bottom of the chin. A proper goatee never has a mustache, but the extended goatee — also known as the Hollywoodian or tailback — incorporates a mustache into its style. The Van Dyke beard also incorporates the goatee style. Balbo Beard. The Balbo beard has three sections: 1) the mustache, 2) patch of hair under the chin, and 3) the lower part below the patch that resembles a typical beard. The Balbo looks somewhat like an upside-down “T.” It gets its name from Marshall Balbo, an Italian Air Marshall during World War II. It shares features with the Van Dyke and Anchor beards. Van Dyke Beard. This style is named after the 17th century Flemish painter Anthony van Dyck, who sported a goatee-mustache combo. The mustache is trimmed so it is only on the upper lip and separate from the beard. The goatee is trimmed below the chin into a point. The Van Dyke beard is similar to other styles like the Imperial and Anchor. Anchor Beard. Another mustache-goatee combination, the Anchor beard picks up its name from its anchor-like shape. The mustache is trimmed into an upside-down angle, like the top of the anchor. The goatee extends below the chin and is styled into a point. The patch below the chin is shaped into the vertical pole of the anchor. This style resembles the Van Dyke and Balbo. Mutton Chops & Friendly Mutton Chops. Mutton Chops actually refers to longer sideburns that grow down to the corners of the mouth. The bottom edge of the sideburns connect by an imaginary line to the corners of the mouth. The sideburns can be allowed to grow wild or be neatly trimmed. With Friendly Mutton Chops, the sideburns and the mustache are connected. In both, the chin is shaved. Verdi Beard. The Verdi beard is a full beard style with a bit more shape to it. The bottom of the beard should be rounded and short. Unlike with the full beard, the Verdi mustache is well-groomed, and can even be curled at the end. This style is named after 19th century Italian operatic composer Giuseppe Verdi. This style is a neater version of the full beard and Garibaldi. Dutch Beard. This style — also known as the Old Dutch Beard — is a beard with no mustache, similar to the style traditionally worn by Dutch men. The sideburns connect to the beard, which is allowed to flare out at the bottom. It has a similar beard shape to the Garibaldi, but without the mustache.